Mishimoto Performance Race Intake SUBARU - Pann Auto Performance - San Diego largest aftermarket automotive performance parts - What do you drive? 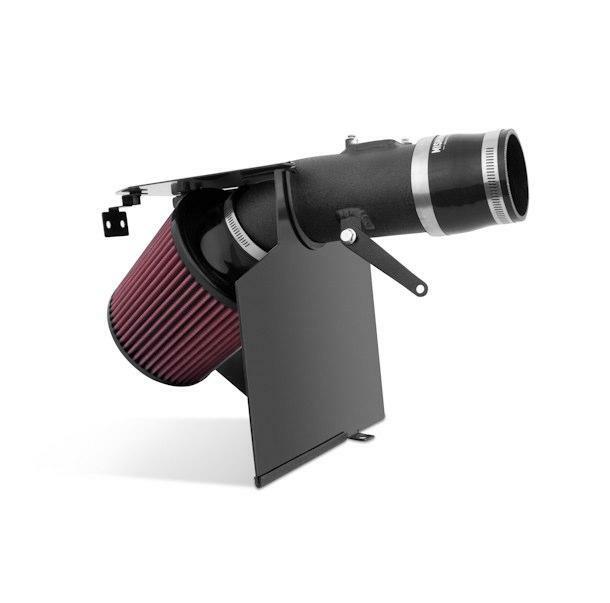 Provide maximum, unrestricted airflow to your engine with the Mishimoto Performance Race Intake. Mishimoto pulled out all of the stops with this intake, featuring a 3” short-ram intake pipe, designed with large turbochargers and maximum airflow in mind. Designed to fit on either your stock or Mishimoto turbo inlet tube, this race intake is also compatible with most aftermarket front-mount intercooler kits. Due to the size of the intake pipe, a re-tune of your vehicle’s ECU is necessary to keep your engine running safe and extracting the most horsepower from the added airflow. The intake pipe also features a CNC-machined air diverter to provide consistent airflow readings to the MAF sensor, making re-tuning quick and easy. The intake pipe is available in a polished or wrinkle black finish. A 3” diameter Mishimoto high-flow air filter is also included which features a built-in velocity stack for maximum flow. An optional airbox is available for this intake, designed to keep unwanted hot engine air away from the filter. The airbox is designed to re-use the stock intake duct to provide fresh outside air to the filter, also retaining a stock-like appearance in your engine bay. This intake comes with all of the necessary clamps, couplers, hardware, and protective rubber edging for a clean install. It will also give your vehicle a highly aggressive intake tone under acceleration. For added cooling and performance on and off the track, pair this intake with the Mishimoto Performance Aluminum Radiator, Performance Intercooler Kit, and Silicone Induction Hose. The Mishimoto Performance Race Intake includes the Mishimoto Lifetime Warranty.